We’d love your help. Let us know what’s wrong with this preview of Murder in the Generative Kitchen by Meg Pontecorvo. With the Vacation Jury Duty system, jurors can lounge on a comfortable beach while watching the trial via virtual reality. Julio is loving the beach, as well as the views of a curvy fellow juror with a rainbow-lacquered skin modification who seems to be the exact opposite of his recent ex-girlfriend back in Chicago. Because of jury sequestration rules, they can’t talk to e With the Vacation Jury Duty system, jurors can lounge on a comfortable beach while watching the trial via virtual reality. Julio is loving the beach, as well as the views of a curvy fellow juror with a rainbow-lacquered skin modification who seems to be the exact opposite of his recent ex-girlfriend back in Chicago. Because of jury sequestration rules, they can’t talk to each other at all, or else they’ll have to pay full price for this Acapulco vacation. Still, Julio is desperate to catch her attention. But while he struts and tries to catch her eye, he also becomes fascinated by the trial at hand. To ask other readers questions about Murder in the Generative Kitchen, please sign up. You have to finish your viewing for the I think this is an amazing idea. It is 2060. Sequestered juries are sent on an all expense paid trip to a resort. People try to get on juries now instead of getting out of it. This jury out of Chicago is in Acapulco. They watch the trial on headsets. The headsets can show the trial superimposed on the real world so you can walk around the resort while you watch. You can't talk to any of the other people in the resort. I loved the two original ideas in this novella - the generative kitchen and the vacationing jurors. The main character is Julio, a juror. I hated him from the beginning. He has a wonderful girlfriend at home. He is planning on breaking up with her because she isn't very feminine looking and she won't change her look to please him. Well good for her! He starts to get obsessed and stalkerish over another juror at the resort. She has an ultrafeminine look due to extensive body modification. He can't talk to her due to the jury rules but he tries to get as close as possible within the rules. He imagines a life with her based entirely on how she looks since he has no idea what she is actually like and it never occurs to him to care. When the jury heads back to Chicago to deliberate he finally gets to talk to this woman of his dreams and finds out that his fantasy and her reality don't line up. It is sort of like every internet troll who suddenly has to deal with a woman who has the nerve to be different from what he thought she should be. I'm not usually a fan of books with unlikeable characters but it served this story well. No one is on their best behavior but characters learn even confronted with it. There is a lot packed into a novella. Murder in the Generative Kitchen by Meg Pontecorvo is an interesting story that works on multiple levels. The Vacation Jury Duty system sends jurors to an exotic location with the catch that they have to daily watch court proceedings through a virtual reality device in preparation for rendering a verdict. Failure to do so, or to break any of the rules, could leave you on the hook for paying for the vacation yourself. The trial involves a death, ostensibly by an automated kitchen that shouldn’t be Murder in the Generative Kitchen by Meg Pontecorvo is an interesting story that works on multiple levels. The trial involves a death, ostensibly by an automated kitchen that shouldn’t be able to harm a person without outside interference. This has led to a wife being charged for the murder of her husband. The case seems like a slam dunk, but doubt begins to creep in. By having a murder trial as the central mystery in the story, Pontecorvo is able to layer in the science fiction elements crucial to the setting of the novel. Initially the trial seems to be an excuse to explore this future society but gradual the trial itself develops a sense of intrigue. The story is told through the eyes of one of the jurors, Julio, who like the reader, is at first less interested in the trial, but gradually becomes drawn in. He is simultaneously trying to maximize his vacation and catch the eye of an attractive woman he suspects of being a fellow juror. The trial becomes very interesting, if not conclusive. Combined with the structure of the jury system itself and the dynamic nature of the jury deliberations (also conducted through virtual reality) there is a lot of intrigue in the story. Pontecorvo manages to pack a lot into this short quick read. Interesting plotlines as well as an interesting central character. I didn’t mind that not everything was wrapped up neatly. Nevertheless, the very end seemed a little abrupt and had characters behaving in a way I found a little jarring. This is a quick entertaining read packed with a lot of ideas, solid writing and interesting characters. I’ll be certain to keep an eye out for future stories by Meg Pontecorvo. Highly recommended.
" While the concept is interesting, I was more than a little disappointed with the execution of the book. Now and again, you read a story that strings you along. You periodically sniff with self-importance and make clever little mental judgments about how it’ll end and anticipate the characters’ actions. Then, you reach the last page and in a groaning moment of “oh snap” you recognize that the author has led you the whole way; your deductions were exactly what they intended; and, in short, you were stupidly easy to misdirect into focusing on the wrong things entirely. This degrading discovery is fol Now and again, you read a story that strings you along. You periodically sniff with self-importance and make clever little mental judgments about how it’ll end and anticipate the characters’ actions. Then, you reach the last page and in a groaning moment of “oh snap” you recognize that the author has led you the whole way; your deductions were exactly what they intended; and, in short, you were stupidly easy to misdirect into focusing on the wrong things entirely. This degrading discovery is followed by the bizarre compulsion to immediately share the story and your concluding inadequacy with other readers like the classic fridge game of “this tastes bad—does this taste bad to you?” Though it’s more like, “Read this. You’ll feel like an idiot at the end. I did.” Your annoyance with the author is mitigated by the intelligent plot design and the detailed futuristic worldbuilding, so there is that, I suppose. If you’re going to be hoodwinked, at least it was beautifully done. For the record, I was given a free copy of this in exchange for my honest opinion—though I fully intend to support the author and buy a copy when it’s available on retail sites. Science fiction is a genre about ideas, but every good story must be about people, too. “Murder in the Generative Kitchen” does well in both areas and should have fans with both people who like science fiction and people who don’t like science fiction because it’s all that “Star Wars” action stuff. The basic idea here is one that probably isn’t far away: automated kitchens that can prepare meals automatically or lead a cook through the steps to make the process easy. 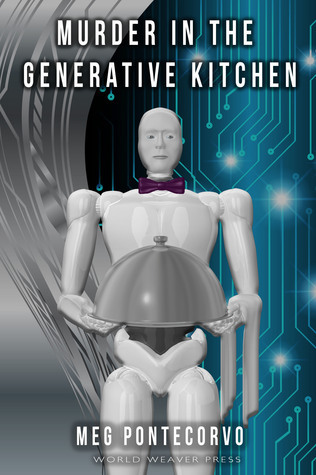 The generative kitchens learn Science fiction is a genre about ideas, but every good story must be about people, too. “Murder in the Generative Kitchen” does well in both areas and should have fans with both people who like science fiction and people who don’t like science fiction because it’s all that “Star Wars” action stuff. The basic idea here is one that probably isn’t far away: automated kitchens that can prepare meals automatically or lead a cook through the steps to make the process easy. The generative kitchens learn from their use and soon provide food that is not only more to the consumer’s desires but healthier. Except that McConnery Ellis has apparently used her Generative Kitchen to murder her husband. Or has she? The author takes this preference and has created a courtroom drama with a science fiction twist. We see the trial through the eyes of Julio Gonzalez, one of the jurors. Attending the trial remotely while staying at a Resort Hotel at taxpayer expense, Julio divides his time between the trial and an attempt to seduce one of his fellow jurors. Trial testimony examines the evidence against McConnery, trying to determine whether she killed her husband or the kitchen poisoned his food without her knowledge. It’s hard not to think of some of Isaac Asimov’s robot stories. This review is of a prerelease version. The novel will be published by World Weaver Press in September. Recommended. My biggest criticism regarding this delightful futuristic tale is that it's not long enough. Pontecorvo's world is fully realized and completely believable. Her characters are 3-dimensional and the writing is witty. I do think the story would have been wonderful as a full-length novel, and hope that Meg Pontecorvo writes more tales about her all-too-human, robot-peppered world. This novelette takes two pretty interesting concepts and expounds on them through the POV of a kind of jerk male juror. What if we sent jurors to resort destinations all expense paid but required them to watch testimony during that time? What if we had "smart" kitchens that not only knew our basic nutritional requirements and could adjust according to our state of health but could also read our mood or "affect" and put in mood-altering serotonins? As a thought experiment, this story kept me reading as our juror, sent to Acapulco, struggled with the restrictions based on jurors while he watched a murder trial where a woman is accused of poisoning her husband through food she cooked in a generative kitchen--food that the defense says was altered by the kitchen itself! The premise and beginning of the story seemed to have a lot of promise and I was excited to read this book - but it fell somewhat flat in the end. Something with 'murder' in the title should give some resolution to the murder; this meandered off to be about the juror's learning curve. That's an OK story line, but what about the other plot lines and themes? They (and the readers) were left hanging. At first this story felt like an odd mix, bouncing back and forth between a fairly serious, and fascinating murder trial, and the almost cartoony situation and character of Julio. At first I found it hard to get interested in his character until I started to realize he fit the world the author created quite well. And even once I started to believe in his character I have to admit I found the murder trial and the concept of a generative kitchen way more interesting than his story. I also found the world created here as a whole rather fascinating and would be very interested in reading more set in it. The pace of story was quick and easily pulled me along and made me want to keep reading but I did have two major problems with this story. One, the ending seemed really convenient and abrupt and two, the “surprise” twist with one of the jurors was really rather predictable but even with those I did find myself quite engaged in the story as a whole. After fighting with his girlfriend, Julio Gonzalez accepts a position on a "vacation jury" to give them both a break. In a not-too-distant future, sequestered jurors get to watch trial testimony remotely from the comfort of their own Caribbean resort (or other tropical locale). The catch? They can't say a word to the other jurors or they'll be forced to repay the entire trip - in some cases, months' worth of their salaries. Julio, being a normal human being, starts to go a bit wacky for lack of s After fighting with his girlfriend, Julio Gonzalez accepts a position on a "vacation jury" to give them both a break. In a not-too-distant future, sequestered jurors get to watch trial testimony remotely from the comfort of their own Caribbean resort (or other tropical locale). The catch? They can't say a word to the other jurors or they'll be forced to repay the entire trip - in some cases, months' worth of their salaries. Julio, being a normal human being, starts to go a bit wacky for lack of social interaction and hijinx ensue. But things get deadly serious once jury deliberations begin and a woman's life literally hangs in his hands. Four out of five stars because the ending didn't quite resolve all the plot threads I cared about, but your mileage may vary. Overall, an entertaining, well-written book. I enjoyed reading this story and finding out more about Julio and the problems he has in his life. I thought the author did a good job of telling us the story of the trial of Mrs Ellis and at the same time, allowing us a glimpse into the pre-occupations of one of the jurors, Julio. The world-building was convincing and entertaining. The story-line of the trial was interesting, though I'd have liked a bit more depth to the final section where the jury are debating their verdict - surely not all t I enjoyed reading this story and finding out more about Julio and the problems he has in his life. I thought the author did a good job of telling us the story of the trial of Mrs Ellis and at the same time, allowing us a glimpse into the pre-occupations of one of the jurors, Julio. The world-building was convincing and entertaining. The story-line of the trial was interesting, though I'd have liked a bit more depth to the final section where the jury are debating their verdict - surely not all the other jurors would have been so extreme in their views? In all, an enjoyable read, though I think the story content was more a novella length and I would have liked a full length book with a full length intrigue. Maybe for next time? Murder in the Generative Kitchen has got to be one of the most original scifi books I’ve ever read. First, imagine it’s not a perosn who kills another person – it’s a kitchen. Then, jury duty basically being a beach holiday where you watch the trial via virtual reality. Suddenly jury duty sounds a lot more interesting, doesn’t it? That’s what happens to Julio, who after a bad break-up with his girlfriend, finds himself interested in one of his fellow jurors. But talking to her is strictly forbidden. The question on whether the kitchen did the killing, or the person did, was what intrigued me the most about this book. The characters were well-developed, in particular Julio, and the writing was engaging. An intriguing view on a high-tech, futuristic world. "Murder in the Generative Kitchen" is a surprisingly philosophical futuristic twist on "12 angry jurors." What is murder? Would an AI agree with your definition? And do you trust a jury that just wants to go home to figure out if it does? This novella is a tension-filled peek into the sausage that is the jury system smashed into a mystery and romance subplot. I enjoyed rooting for Julio (the main character), as he navigated the murder mystery, the judicial system, and his fellow (attractively scu "Murder in the Generative Kitchen" is a surprisingly philosophical futuristic twist on "12 angry jurors." What is murder? Would an AI agree with your definition? And do you trust a jury that just wants to go home to figure out if it does? This novella is a tension-filled peek into the sausage that is the jury system smashed into a mystery and romance subplot. I enjoyed rooting for Julio (the main character), as he navigated the murder mystery, the judicial system, and his fellow (attractively sculpted) jurors. The ending was a little abrupt, but I had a great time getting there. In all, well done, fun read. It was interesting,but really seemed to have two separate themes going at once..a futuristic trial and a juror attempting to "get with"another juror. I felt this was a totally unnecessary plot line, as the ending could have been exactly the same without it. I liked all the court parts, the jury deliberation, etc.,and I liked the ending. I received this as a Library Thing Early Reviewer ebook. I liked the idea of the book but I did think that it was too short. I like a good novella but this could have been made into a nice novel (300ish pages instead of the 120 it was) Although I am not a sci-fi fan I did like the storyline as I am a sucker for murder mysteries and I was intrigued that in this book it was focused on the trial. Won an ARC from Library Thing Early Reader program. The premise of this novella was fantastic. I really enjoyed the trial and the vacation jury concept. The romance stuff was unnecessary and I would have preferred more details and time spent on the trial aspect instead. I think it had a lot of potential and mostly got it right, but the end seemed rather abrupt and unsatisfying. This lovely, mystery novella is set in the future where machines can learn about their users and adapt to their needs and desires. I liked the author's exploration of the legal system, the rules the kitchen was programmed with and how the kitchen may have interpreted those rules. Loved the premise of this book and thought the writing was generally high-quality, but the plot fizzled a little bit and then ended too abruptly. Would read more by this author though.